I have mentioned before that I have a "To Cook" list. What I did not tell you is that, in addition to a flurry of handwritten lists that can be found in every room of my apartment, I have a computer file of recipes organized into many, many categories and subcategories. You would think that this would be enough to keep me busy, but I can not seem to stop myself from adding more and more recipes to this list, and at a rate much faster than I actually churn out dishes. 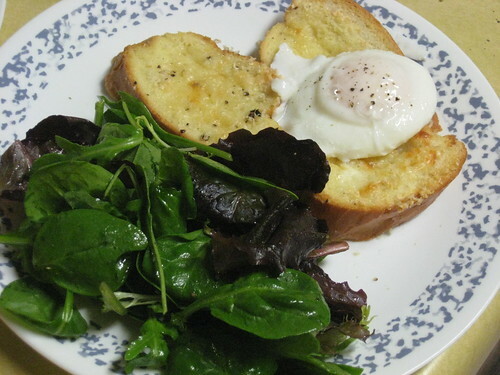 The other day, while I was on Gourmet.com checking to see if any of the "exciting new initiatives" had been revealed, I came across this recipe for a Savory Parmesan Pain Perdu with Poached Eggs and Greens, and I knew immediately that I had to add this dish to the queue. You see, I am the type of girl that loves breakfast foods for dinner. Pancakes, waffles, omelets, hash browns, French toast... yes please. And poached eggs, well they hold a very special place in my heart. But when I went to add the recipe to my favorites, I realized that I had already bookmarked this last summer. Obviously this was a sign that I needed to make this French toast immediately (and that I needed to actually read through my recipe file every so often). Now that I have tried this recipe, I am sorry that I waited so long. It requires almost no work, and there are only a few ingredients, most of which I always have in my fridge and pantry. But don't let the simplicity fool you; this dish is fantastic. The French toast is creamy, but the salty bite from the parmesan cheese sets it apart from its cinnamon-laced, sweet custard cousin. The poached egg is what really pushes this dish over the top: the soft yolk makes a rich sauce for the toast, adding an indulgent touch. A large pile of lightly dressed greens keeps this from feeling too heavy, and also makes it seem more like a dinner (though I would still want a salad if I were making this for brunch). Now that I have found this recipe (for the second time), I am going to make sure that it doesn't get lost in my ever-expanding recipe bin. Butter or spray with nonstick spray a small baking dish or 9 inch pie plate. Whisk together milk, one egg, and 1/4 teaspoons each salt and pepper (I did this right in a 2 cup measuring cup). 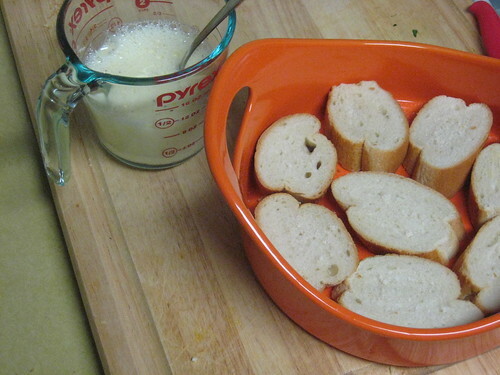 Pour over bread, then evenly distribute the grated parmesan over the bread. Allow this to sit until all of the custard is absorbed, 10 to 30 minutes. 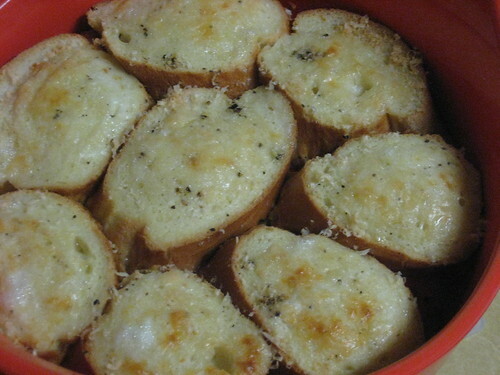 Once absorbed, dot the top with butter and bake, uncovered, until the bread is golden brown, 20 to 25 minutes. Meanwhile, bring a pan of water to a slight simmer and add a splash of vinegar. Crack one egg into a measuring cup or small bowl and slide into the water. Repeat with the remaining egg and poach until the white is set, 2 to 3 minutes, or longer if you do not like runny yolks. Remove with a slotted spoon. While eggs are poaching, dress greens with vinegar, oil, and salt and pepper to taste. Divide the French toast between two plates, and add a pile of greens. Top each plate with a poached egg and season lightly with salt and freshly ground pepper. *My slices were small and not very diagonal, so I used 8 slices. **I never have whole milk, so I put 2 Tbsp. half and half in my measuring cup and poured in enough skim milk to make one cup. In my opinion, this would still be very good even if made with only skim or low fat milk.